Any technology that satisfied this design assignment would amaze us. We would praise it as the latest and greatest advancement toward a sustainable future. Fortunately for us, this assignment has already been satisfied. This quote refers, quite simply, to a tree. We often talk about new discoveries and technologies when we talk about climate action. In doing so, we overlook the most fundamental and efficient systems around us—the ecological ones. Natural ecosystems can not only provide climate benefits, but also make our cities healthier and more livable. 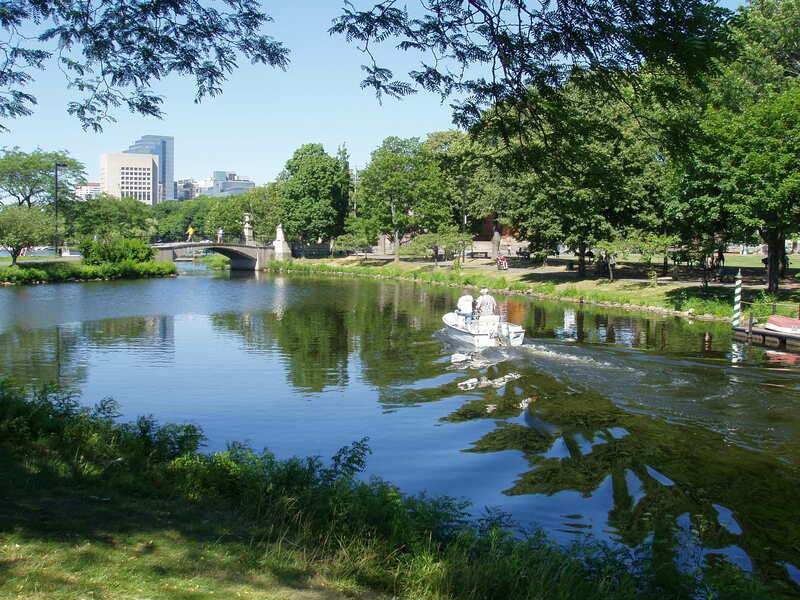 A prime example of this is the Emerald Necklace in Massachusetts, designed by landscape architect Frederick Law Olmsted. The Emerald Necklace is a linear network of parks and open spaces connecting Boston to Brookline. It is praised for giving city dwellers a chance to enjoy a connection to nature, and of course, for its aesthetic beauty. The Emerald Necklace harnesses nature for human benefit. There is an intentional focus on preserving and imitating ecological systems in the built environment. This approach falls under the umbrella term "green infrastructure." Charles River Esplanade, part of the Emerald Necklace in Boston. Green infrastructure is any practice that uses or replicates natural systems to achieve a desired outcome. This includes green roofs, bioswales and rain gardens. Green roofs replicate meadows to retain water and restore habitats on the top of buildings. Green infrastructure does not exclusively mean vegetation. Permeable surfaces are considered green infrastructure as well, because they handle rainfall the same way natural landscapes do. Green infrastructure looks to nature for advice, restoring and replicating ecological systems to create human benefits. This may seem obvious, but it is a radical departure from our dominant approach to infrastructure (often called “grey infrastructure”). To understand the difference, let's consider stormwater. Grey infrastructure is designed to quickly divert water. This approach views water as a hazard to be swiftly dealt with. With green infrastructure, water is a resource. It is valuable for keeping landscapes and waterways healthy. With green infrastructure, climate challenges are reframed as opportunities. Green infrastructure not only reduces the load on aging grey infrastructure, but also provides opportunities to nourish plants and provide drinking water. Sounds pretty good, doesn’t it? When it’s hot, we can rely on green infrastructure to reduce the urban heat island. Plants absorb solar energy for photosynthesis and provide cooling through evapotranspiration. Vegetation can also shade buildings and nearby surfaces, which decreases the demand for cooling. Cooler environments and less energy production means less smog. Green infrastructure is very effective at lessening the direct and indirect health effects of hot weather. When it rains, we can retain and infiltrate water where it falls with green infrastructure. The retained rainfall infiltrates the ground, increasing the groundwater supply. This reduces runoff, which limits the pollution of waterways and prevents combined sewer overflows. Combined sewers are the infrastructure responsible for collecting both sewage and surface runoff. When the volume of runoff exceeds the sewer’s capacity, overflows occur. This contaminates cities with sewage, creating environmental and human health hazards. When we need a dose of nature, we can seek out green infrastructure projects that remediate unused urban areas. These spaces provide habitats for native species, as well as relaxation and recreation opportunities for people. Green space has been shown to decrease stress, reduce crime, and promote community cohesion. Green infrastructure can provide the dose of nature you need and can also revitalize a community. Proximity to green space has been shown to increase rent premiums and improve tenant satisfaction. When greenhouse gas emissions are high, we can sequester emissions with green infrastructure. Plant matter and soil media use and store carbon dioxide. Green infrastructure improves energy efficiency and reduces cooling loads, driving down emissions created by energy production. When planning for the cities of the future, let’s make sure not to overlook green infrastructure—it’s Mother Nature’s own high technology, with so many benefits for us to enjoy. Stay tuned for more articles exploring current practices, best practices and GBCI’s toolbox for green infrastructure development, including SITES, LEED, Parksmart and more.